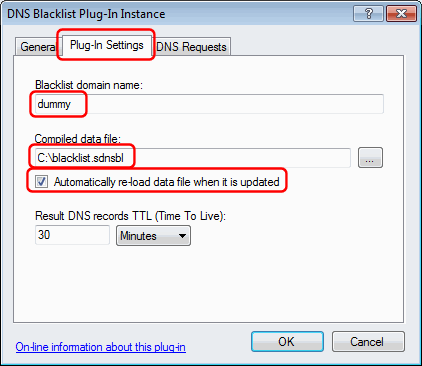 Using the DNS Blacklist plug-in and the Ignore DNS Request plug-in it is possible to block (ignore) DNS requests originating from IP addresses listed in a DNSBL/RBL style blacklist (can be as simple as a plain text list of IP addresses separated by line feeds). 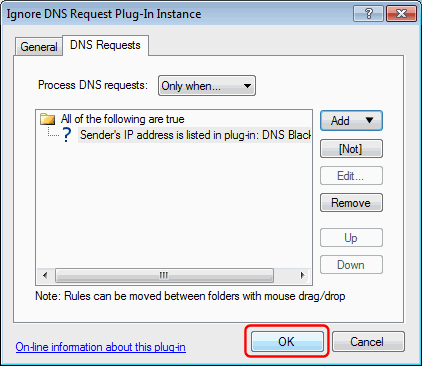 Note that Simple DNS Plus has a built-in feature to ignore DNS requests from specified IP addresses - see main windows / Tool menu / IP Address Blocking. 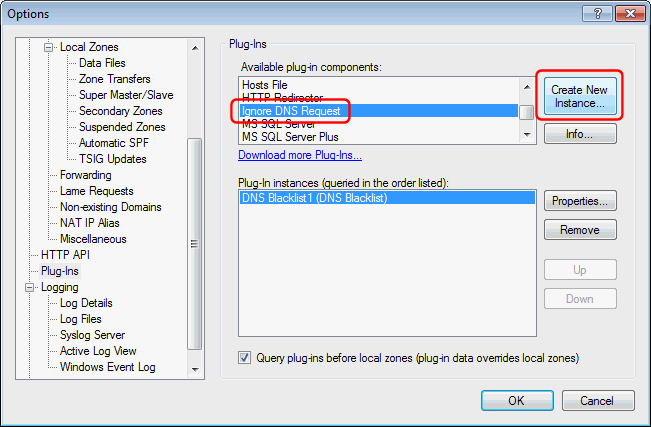 You can also use the Ignore DNS Request plug-in by itself - specifying the IP addresses in the DNS Requests tab. However, the following may be easier to use and/or more efficient if you have a really long list of IP addresses, or if you want to automate this in some way. First you need to create (or download) a list of IP addresses that you want to block, and then "compile" this into the format understood by the DNS Blacklist plug-in using the DNS Blacklist Editor tool (can also be used from command line / batch scripts for automation). Next download the DNS Blacklist plug-in and unzip this to the plug-ins folder. 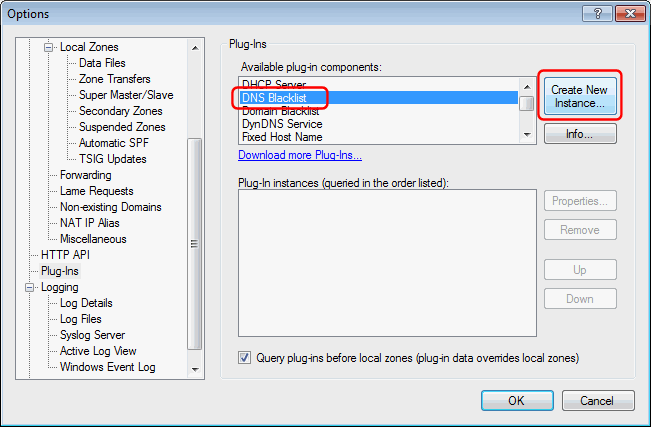 The Ignore DNS request plug-in comes with Simple DNS Plus, so you don't need to prepare anything for this. In the Plug-In Instance dialog, select the "Plug-In Settings" tab, and enter something in the "Blacklist domain name" field (doesn't matter what), specify the location of the compiled blacklist file. 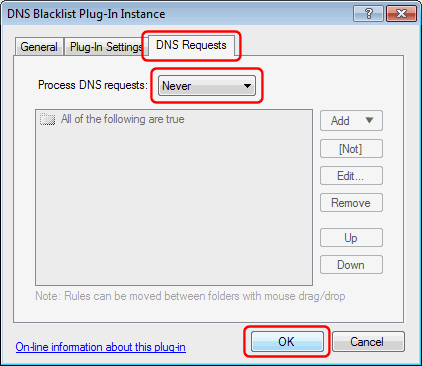 This prevents this DNS Blacklist plug-in from processing any DNS requests directly. 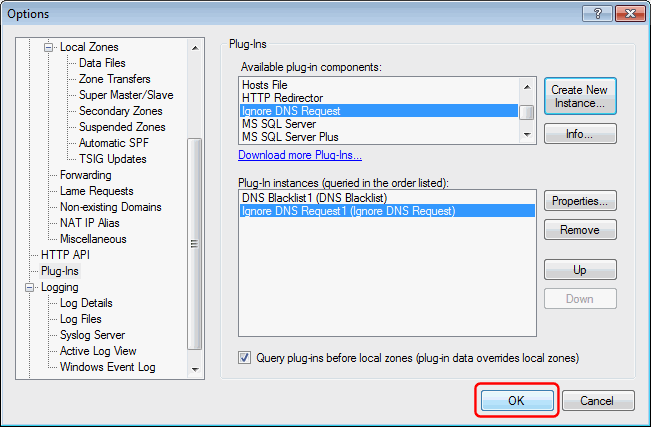 Back in the Options dialog you should now have an instance of both the DNS Blacklist plug-in and the Ignore DNS Request plug-in listed. Now all DNS requests originating from IP addresses in the blacklist will be ignored. Note: .NET developers may also consider creating their own dedicated plug-in for ignoring/blocking requests according to their own custom rules using the "JHSoftware.SimpleDNS.Plugin.IIgnoreRequestPlugIn" interface.